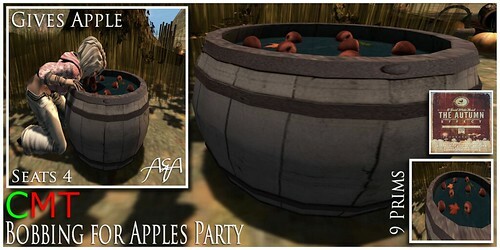 A&A@The Autumn Effect Hunt 2.0 - Sept 15 - Oct. 15, a photo by ::A&A:: Life is your creativity! on Flickr. Sponsored By: AsYLUM, Cute Poison, cStar Limited, elephante poses, Milk, Leri Miles Designs, Luckie, pure Perfection, Razor & Somnia. All stores in this hunt will be providing a new gift. All gifts in this hunt will be FREE. Make sure you join the Depraved Events group to keep up to date on who’s doing who or what, when and why…it’s useful for hunt questions as well. All store SLURL’s and hints will be posted on our website before the hunt officially starts, make sure you check there often for any changes or problems discovered along the way. If you encounter an issue that has not yet been posted please IM or send a NC to Heather Smithson right away. Spread the word, don’t venture out alone, grab your friends and hit the grid. As always, our main goal is to make sure you have fun. Be respectful to us and participating designers by following our few simple rules!